Please note that above price is subjected to change and is for reference purpose only. Kindly contact Toyota Nepal to get the latest showroom price. Note: Toyota car price list was last updated on February 10, 2019. Toyota car & SUV in Nepal is distributed by United Traders Syndicate Private Limited (UTS). It is part of Vaidya’s Organization of Industries & Trading Houses (VOITH). Toyota, global Japanese brand, is number one choice in the world when it comes to automobile. Established in 1967, United Traders Syndicate Pvt. Ltd. has been distributing Toyota cars and its genuine parts since then. Founded by Late Dr. V.G. Vaidya, the then Chairman of the organization, it has continued to grow under current management team. Despite the increasing competition in automobile industry in Nepal, Toyota has been able to maintain its dominance in the sector. It has dealers in 8 districts spread throughout the country. United Trade Syndicate has its own workshop located in Ananda Nagar, Dhumbarahi where customers can get all sorts of servicing and maintenance services under one roof. Highly skilled technicians and engineers are employed at the job. They are trained by Toyota Motor Corporation Japan. This training includes technical bulletins, in-dealership training, sales-service and marketing. 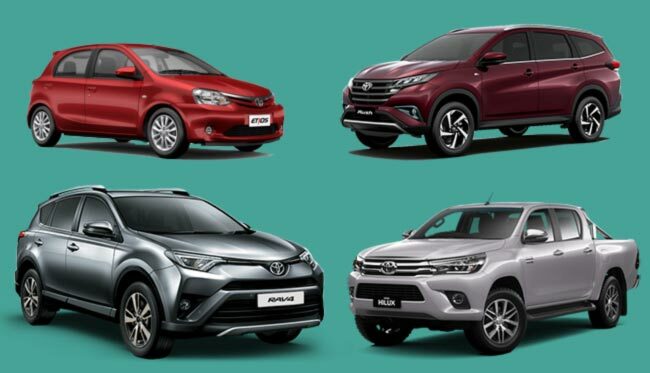 Toyota in Nepal has all category of cars be it in-general urban cars, SUVs or pickups. Some of their popular products include Land Cruiser, Fortuner, Liva, Etios, Rush, Hilux, etc. Toyota car starts at price of Rs. 32 lakhs in Nepal and goes upto 4.08 crores. This is the biggest price range available for any brand in Nepal. United Traders Syndicate Pvt. Ltd.
Also, you can message us your queries regarding Toyota car price in Nepal or its specifications/features at our Facebook page.